Dehydrated Maggots - Coming Soon! Pollinate vegetable crops including onions, carrots, radishes, cauliflower, broccoli, lettuce, buckwheat, sunflowers, garlic, peppers and canola. 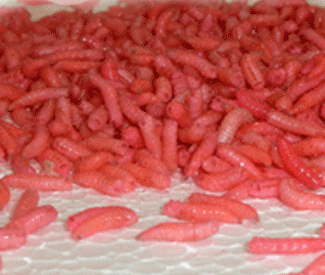 The maggots are most widely used in fishing for Kokanee (land-locked salmon), whitefish, perch, carp and other pan fish. The larvae is a meat fly, commonly known as the Blue Bottle fly, approximately ¾” in length. Forked Tree Ranch Maggots & Flys are not only grown in North Idaho, they are fed Columbia River Wild Chinook. Every Forked Tree product is 100% Grown and Sourced in the U.S.A.
Our Dehydrated Maggots are a great food source for Reptiles; Iguanas, Gekkos, Chameleons, and more. 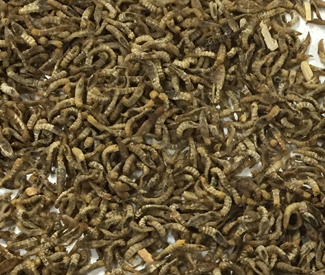 High in Omega 3 & 6, and certified to have a 53% protein content, our Dehydrated Maggots are a prefect treat to help keep your reptile healthy. Our flies are being used successfully in greenhouses year around for many types of vegetables and canola. They are also being used to increase production of vegetable crops grown in greenhouses, such as peppers and tomatoes. Reptiles, Pot Belly Pigs, Praying Mantas, Geckos, Chameleons, Iguanas, just a few of the animals that will benefit from our Dehydrated Maggots. 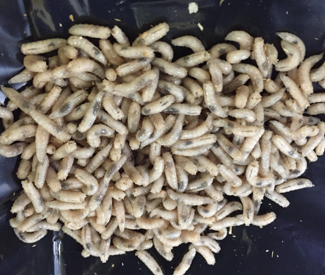 High in Omega 3 & 6, and certified to have a 53% protein content, our Dehydrated Maggots are a prefect treat to help keep your store stock healthy. Our maggots are most widely used in fishing for Kokanee (land-locked salmon), whitefish, perch, carp and other pan fish. 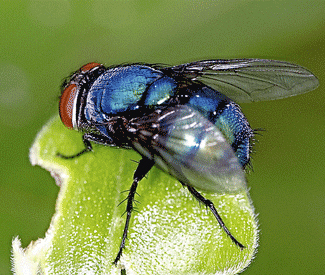 The larvae is a meat fly, commonly known as the Blue Bottle fly, approximately ¾” in length.